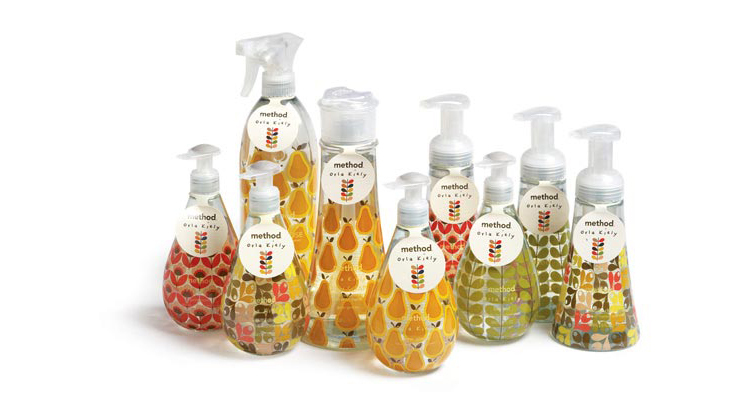 Non-toxic, biodegradable natural cleaning supplies with a focus on minimalist product design. What smells great, comes in a designer bottle, makes your life easier and is GREEN? A Method cleaner! You get you house, hands, clothes, dishes or whatever else you decide to clean, sparkling clean with minimum effort and natural, biodegradable ingredients. You can clean for hours without having to worry about inhaling toxic fumes or coming in contact with harmful ingredients. You get cleaner containers that you will want to proudly display on your bathroom shelves. No more hiding of hideous packaging. You will end up with a clean house that smells of flowers, herbs and fruits instead of harsh chemicals. No need to evacuate the place! All the packages are made out of recycled plastic, oftentimes recovered ocean plastic that is so harmful to marine ecosystems as well. 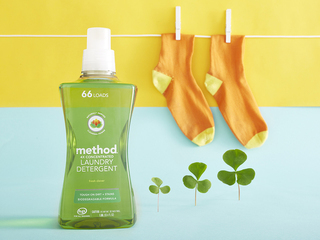 Method does not test on animals and they were PETA's “company of the year” in 2006. Renewable energy is used to power their offices and factories. They are Cradle To Cradle certified and B Corporation certified for their effort to achieve social and environmental change. So start cleaning your cupboards from all the toxic sludge poisons that you considered “cleaning agents” and get some seriously effective, wonderful-smelling Method cleaners for a dirt-free home and a healthy planet. Start cleaning with some seriously effective, wonderful-smelling Method cleaners for a dirt-free home and be free of toxic sludge poisons that you considered “cleaning agents”.